From my post Hearing in Colors, Tasting Voices: The Experience of Synesthesia. McNerney goes on to point out, “Countless popular psychology books that either focused on or mentioned creativity were published in 2012. “Susan Cain lambasted brainstorming and ‘GroupThink’ in her bestseller and introvert manifesto Quiet: The Power of Introverts in a World That Can’t Stop Talking. Drawing on a wide body of robust research she reminded our hyper social world that working alone is usually better than working in groups in terms of productivity and creativity. “Dan Ariely’s book The Honest Truth About Dishonesty contains a chapter on the relationship between dishonesty and creativity – honesty might not be good for creativity. “The Power Of Habit by Charles Duhigg made some important suggestions for creativity: if you’re in a rut, try changing your routine. Read more in The Science of Creativity in 2013: Looking Back to Look Forward, By Sam McNerney. Also see more titles in my list of Books for the Creative Mind. 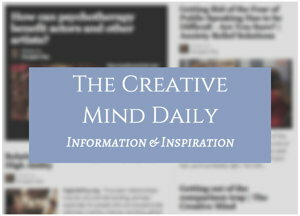 You might also like posts on my main site in the category Creative inspiration – Muse. Does Brainstorming Enhance Creative Thinking and Innovation?